Linda Rohrbach Austerberry fashioned a ceramic plaque installed on Earl's base to represent a student who lost her life during the project. Artist Robert Williams adds a special touch and some humor to Earl. In the end, Bob was reluctant to part with his specially-designed bumble bee. Earl was fashioned by artist Robert Williams. 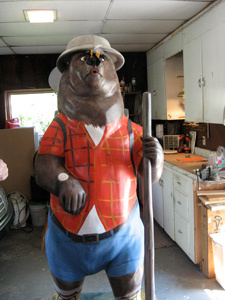 Earl is the fourth bear Bob has created for Bear Fever. Love the bumble bee! Not sure Earl does, however! 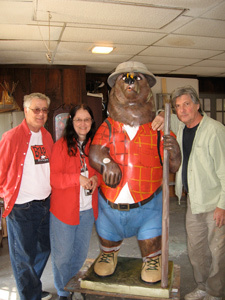 Bear Fever's "groupies," Barbara Nussmann and Kent Farrell from Rochester, New York made their sixth trip to Boyertown to see the 2010 additions to the project and enjoyed meeting with Earl's artist. Bob Williams majored in illustration and fine art at the Philadelphia College of Art and has worked as a combat artist, illustrator and fine artist. He does commercial and residential murals as well as fine art of local scenes. Bob’s murals can be found in Boyertown along South Reading Avenue where he re-created Dave Larson’s painting “A Special Kind of Place.” A second outside mural can be found on the north wall of the State Theatre on the corner of North Reading Avenue and Fifth Street. Images from the history of Boyertown are featured. Another mural can be found inside Boyertown Multi-Service on Spring Street where assorted medals awarded to service men and women are illustrated. 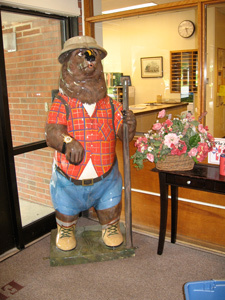 In addition to “Earl,” Bob’s contributions to the Bear Fever project include “Bear Paws” sponsored by National Penn Bank and located at the Bally branch on Main Street, “Spike,” sponsored by All Balls Better Bearings and Components, Power Sport Industries, Inc. located in New Berlinville, and “Joe Bear,” located at Ultimate Printing in Bally, PA.
Bob served as one of only a few Combat Artists in the U.S. Marine Corps in Viet Nam when he was 21 (1969 through 1970). While his official work—paintings and drawings— are now part of the permanent collection of Combat Art at Headquarters, Marine Corps/Dept. of Navy. The students at Earl Elementary School during throughout the school years 2008-2010 were determined to have their own Bear Fever bear and were challenged to raise over $3500 to fund the project. To do so, students, staff, and their families decided to collect pennies. Several students stepped up to coordinate the effort, and pennies came from everywhere. The students were assisted by veteran teacher Joe Vendetti. This extraordinary effort demonstrates uncommon dedication and was applauded in an all-school assembly in May 2010 when Earl was debuted. Students who had “graduated” from Earl were invited back for the ceremony and applauded for their tenacity and leadership. The Earl Elementary School is located in rural Berks County on Route 73 approximately five miles west of Boyertown. 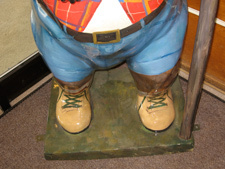 “Earl” represents the rural aspect of this elementary school and features a hiker “uniform,” complete with a plaid flannel shirt—a little tight around the belly, a walking stick, comfortable hat, backpack and boots made for walking through the Pennsylvania countryside. The added attraction poised on “Earl’s” nose is artist Bob Williams’ favorite detail. 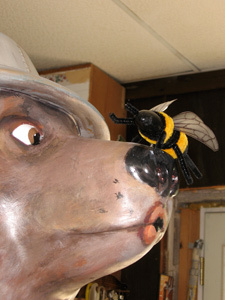 The bumblebee was created especially for the project and Bob found himself reluctant to let him leave his studio! 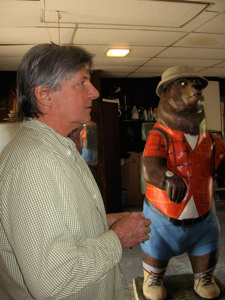 In 2005, the year 35 Bear Fever bears made their debut, Boyertown’s Bear Fever community art project brought Barb Nussmann and Kent Farrell from Rochester, NY, who photographed each bear in the collection. At that time, Nussmann and Farrell had visited almost 70 similar community art projects and minor league baseball stadiums around the country over several seasons. Each of the Bear Fever bears were photographed, and the Bear Fever collection became one of many albums as part of Nussmann’s personal library of photograph albums. Currently her collection of albums features 175 projects they’ve visited within the past 6 years. Some of their favorite projects include one featuring gnu’s, the Vermont benches,, clocks, Washington’s hares, and many projects featuring bears. Because Boyertown’s project is on-going and has added an average of 5 new bears each year, the couple has returned each spring to meet the project’s new bears and take photographs of them where they have been installed. During this year’s visit, the Stahls took them to see Junior High East’s J. T., Serenity Junction’s “Joe Bear,” “Bashful,” sponsored by Boyertown High School’s Class of 2005, “Spike” at Power Sports Industries, “Seal-ia” at Sealstrip Corporation, “Bear-Aid” at PMMC’s Boyetown Walnut Street Center, and “Earl” sponsored by Earl Elementary School which is still in the hands of artist Bob Williams. Each season, Jane and Paul Stahl, coordinators of the Bear Fever project, act as tour guides for these loyal fans and have a chance to view the couple’s new albums of projects like Bear Fever. The Stahls continue to encourage the couple to create a book featuring each of the collections they’ve visited knowing how popular these projects become to the communities that host them.